Android devices have a metric ton of uses that range of ridiculously simple to absurdly complex. 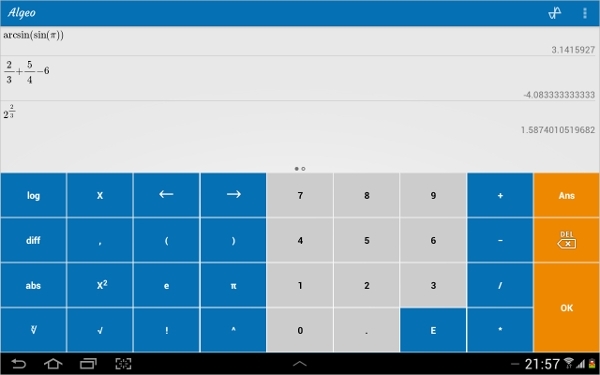 One of the more simple uses for an Android device is to use it as a calculator and this is one of the better uses. Algeo Graphing Calculator is a very solid option for casual use and academic use. It has a simple interface which makes basic calculations a breeze and digging into the app a little bit reveals some more complicated functions that every student likely needs for their trigonometry class or algebra class. 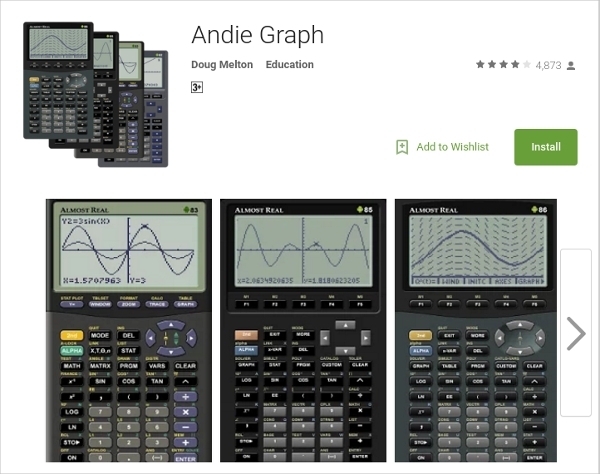 Andie Graph isn’t a calculator on the face of it. It’s actually a TI-series emulator that lets you run TI-series ROMs. It’s possible to have an actual TI calculator on your device. It’s a little complicated but once you get it done, you can keep your bulky calculator in the desk drawer and just use your phone. TI-8X series work great as standalone calculators, showing 8 lines of history, using standard mathematical notation. TI-82 series designed for algebra and trigonometry. Graph and compare functions, perform variable substitution, and solve single variable equations. The TI-83 is designed for statistics and trigonometry. Graph and compare functions, and perform data plotting and analysis and many more series. 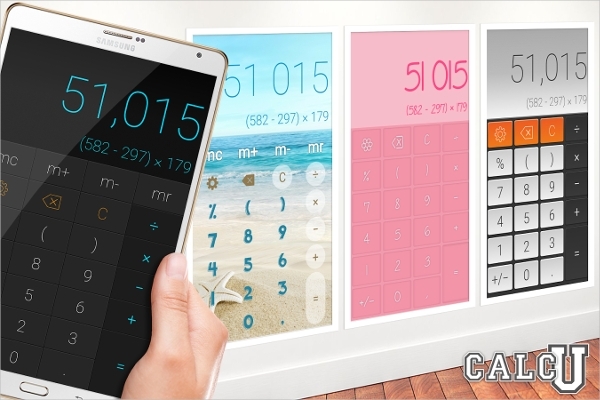 Calcu is a calculator app that focuses more on style than functionality. It has the basic stuff with some extra functions thrown in like calcus and physics. Beautiful and intuitive interface with gesture based control and navigation. See instant results of calculations as you enter them. Choose from a range of 12 stylish themes. Calculator++ is a scientific/graphing calculator option with a lot of unique features. Along with the basic stuff, you get a dedicated copy/paste button, support for Android 1.6 and up, a widget, and more. It’s great for the basics and some light computations in the more complex mathematics. Access additional features from the main screen of the app using gestures. No need to press “=” anymore – result is calculated automatically and it Copy/paste’s with a single button press. 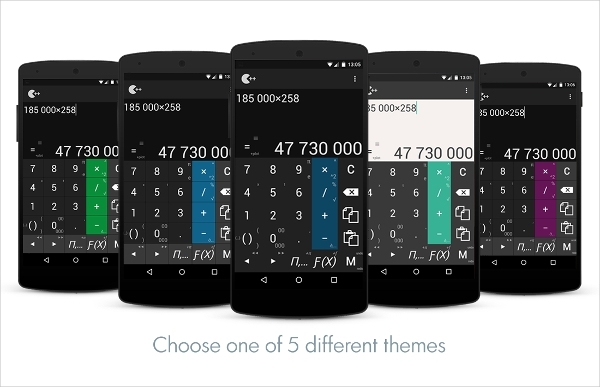 Calculator++ can work in a separate window floating over other applications on your phone. Financial Calculators are a set of calculators to help with calculations in and around finance. It contains things like a credit card payoff calculator, APR calculator, loan calculator, currency converter, stocks and bonds calculators, and much more. It’s also totally free. 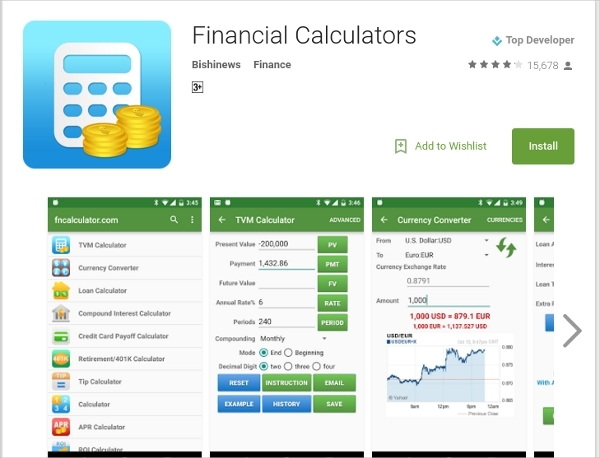 Finance and Investment Calculators, Stock Calculators, Credit Card Calculators. Retirement Calculators and miscellaneous calculators. Also, user can send the calculation results to others via Email. Financial Professionals can email the quote to their clients.